The Rule of Law and Human Rights (RoL) Programme of the OSCE Project Co-ordinator in Ukraine (OSCE PCU) implements series of projects in partnership with national stakeholders aimed at upholding the rule of law, promoting and protecting human rights. In 2019, the RoL Programme will provide expert advice and facilitate broad discussions on justice sector reforms, including constitutional and decision enforcement reforms. It will continue efforts to improve law-school education and to promote a human-rights education in schools. For judges and other legal professionals, it will help to introduce sustainable courses and courses evaluation tools with a focus on human rights and other OSCE commitments. It will work closely with civil society to support trial monitoring in line with best international and national practice. Key partners include the Constitutional and the Supreme courts, the Parliament, the School of Judges, the Ombudsman, the ministries of Justice and Education, and law schools. • Computer literate with practical experience in Microsoft packages. The selected intern may participate in the group health insurance scheme at his/her own expense. The OSCE will cover life and accident/disability insurance. If the intern opts to arrange his/her own medical coverage, he/she shall provide evidence of medical coverage for the duty station he/she applies to, and for any eventual duty trip destinations. Please note that the OSCE is not in a position paying any remuneration during the period of internship nor reimburse travel expenses. Some compensation towards the cost of living may be offered to interns who do not reside in the place of assignment. This position is open for residents of Ukraine only. The expected duration оf internship is 6 months commencing from April 2019. We strongly encourage applicants to use the online application system at https://jobs.osce.org; the Vacancy Number is VNUKRC00545. The deadline for applications is 3 March 2019. If you have difficulties with the online system, please use the Internet Explorer to find the vacancy. Applications received after the published deadline will not be considered. Due to the high volume of applications, only short-listed candidates will be contacted. Details of the assignment and contract may be further discussed during the interviews. The OSCE retains the discretion to re-advertise the vacancy, to cancel the recruitment, to offer an appointment with a modified job description or for a different duration. The internship does not constitute a commitment to future employment with the OSCE. 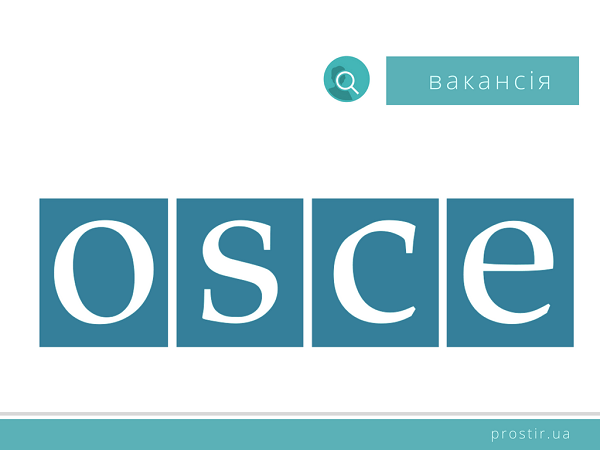 Джерело: OSCE Project Co-ordinator in Ukraine.